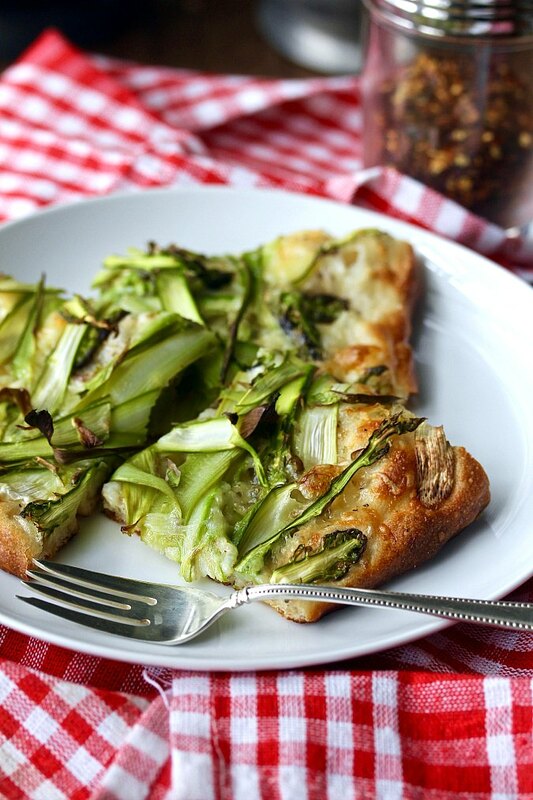 The Brie on this pizza paired deliciously with the shaved asparagus. Topped with Parmigiano-Reggiano, garlic, black pepper, and a few sprinkles of course sea salt, this pizza was killer good. I made this shaved asparagus pizza because I had just received a gift of about four pounds of fresh Michigan asparagus (I seriously need to learn canning and pickling). There is a lot to be said for beginning with an ingredient that you have to create a recipe rather than finding a recipe and going out to get the ingredients. I am certain that I would have never thought of making asparagus pizza unless I had a boat load of excess asparagus, and I was so happy I did! While fresh produce creates a sense of urgency to use up the ingredient before it spoils, I definitely need to do this with all of the various grains, spices, and condiments I've managed to stockpile. I might just be surprised, as I was with this amazing pizza! Time to get all "konmari" in my kitchen! 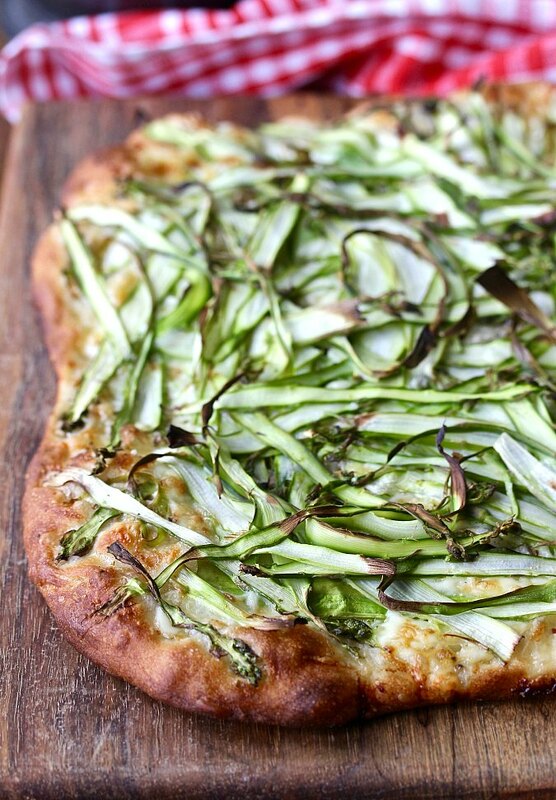 This shaved asparagus pizza is actually now one of my new favorite pizzas. The crust is super crispy and airy, and the Brie, a cheese I'd never expect to find in a pizza, pairs perfectly with the asparagus. Use a vegetable peeler to create the ribbons of asparagus. The job is a little tedious, but the results are well worth the effort. The pizza dough recipe provides for two crusts. You can double the amount of toppings and make two asparagus pizzas, or use the rest of the dough to make a different style of pizza, including one that is more traditional, or just a focaccia. You can also freeze half of the dough for later. If you want to cut the pizza dough recipe in half, you'll have to knead by hand or with a food processor, as your mixer will probably not be able to handle such a small amount of dough. June is National Fruit and Vegetable month! After the recipe, be sure to check out the rest of the #FoodieExtravaganza fruit and vegetable recipes, hosted by Family Around the Table. Note: This recipe makes twice the required dough. Prepare other toppings for the second piece of dough, or brush the dough with olive oil and bake as you would focaccia. Mix the flour, sugar, salt, and yeast in the bowl of a stand mixer on low until just combined. Add the water and mix on low for 30 seconds. Switch the speed to high and mix for about 3 minutes, until the dough comes together. The dough will suddenly coalesce and begin to ride up the paddle attachment. Scrape the dough back into the bowl, cover, and let rise until doubled, about 90 to 120 minutes. Brush two half sheet pans with olive oil. Divide the dough in half and form each half into a ball and place one each seam side down on the pans. Top each piece of dough with a drizzle of olive oil and sprinkle with sea salt. Let sit, uncovered, until doubled, about 1 to 3 hours. Place a pizza stone in the middle of the oven and heat it to 500 degrees F.
Gently stretch the dough balls to fit the pans without deflating the dough. This may take some time if the dough becomes resistant. 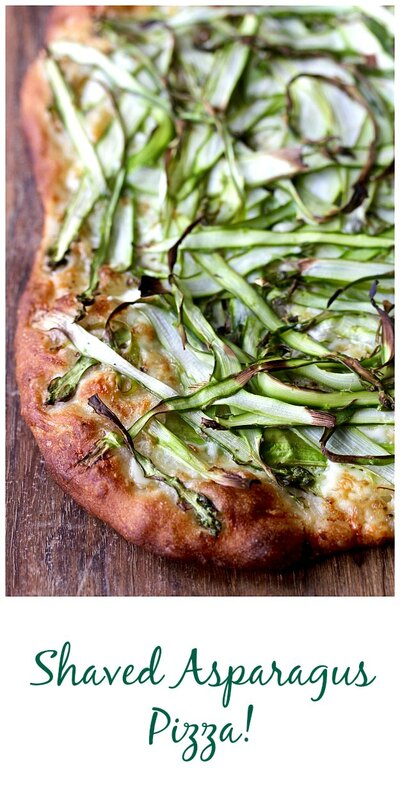 For the asparagus pizza, cut the Brie into about 15 pieces, and press them, evenly spaced, into the dough. Sprinkle the dough with the grated garlic, Parmesan, and black pepper. 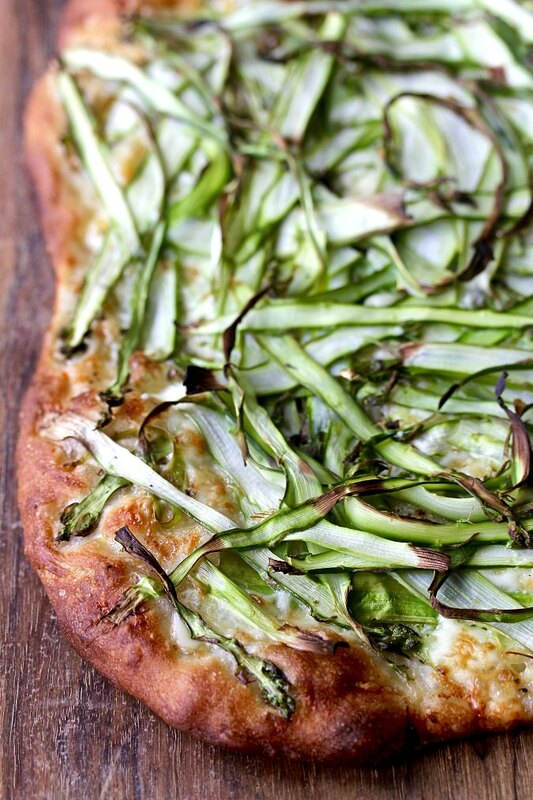 Spread the shaved asparagus over the top of the dough in big handfuls. Sprinkle with sea salt, and bake in the pan on top of the baking stone for 18 minutes. Slice and serve. Bake the other half of the dough sprinkled with olive oil and salt, or with toppings of your choice. This recipe is adapted from The Sullivan Street Bakery Cookbook by Jim Lahey. There are so many amazing recipes in this book. Welcome to #FoodieExtravaganza. Posting day is always the first Wednesday of each month. If you are a blogger and would like to join our group and blog along with us, come join our Facebook page Foodie Extravaganza. We would love to have you! I love this Karen, especially the fact that you used brie cheese along with the asparagus. Thanks Wendy. The Brie was so good on this pizza. That Michigan asparagus is great. And this is a fantastic idea to use it! It is great, isn't it? Thanks, Sue. Looks beautiful! Asparagus is so good this year. Love that you shaved it so that you get even more tastiness per bite! Thanks Jolene. Shaving it can be tedious, but the results were worth it! Cool idea! Does the fact that you grate the asparagus mean that you can use the whole spear without trimming off the tougher bottom part? You don't have to trim the asparagus at all. I just used the end as a handle, and tossed it when I had shaved the entire piece! You'll love this pizza. I made a pizza with shaved asparagus recently as well and loved it - I like the idea of brie in there too. Yum! Thanks Caroline. The brie was delicious. Oh, this sounds like a wonderful pizza recipe. We eat a lot of pizza so this would be a nice lighter version for us.